Celebrate Global Handwashing Day, October 15, 2018! October 15, 2018, marks the 11th annual Global Handwashing Day. This observance increases awareness and understanding of handwashing with soap as an effective and affordable way to prevent disease around the world. Handwashing is simple, inexpensive, and can dramatically reduce the number of young children who get sick. Educating students on the importance of handwashing with soap and key times for when and how to wash hands properly is essential to preventing diseases like cold and flu. Together, parents, teachers, and school administrators have the power to create a culture of handwashing in schools that can help improve attendance by keeping everyone healthy. 1) Join the CDC social media campaign – Post a photo of yourself or others showing your clean hands using the hashtag #HandwashingHeroes. Check out the campaign webpage for more details. 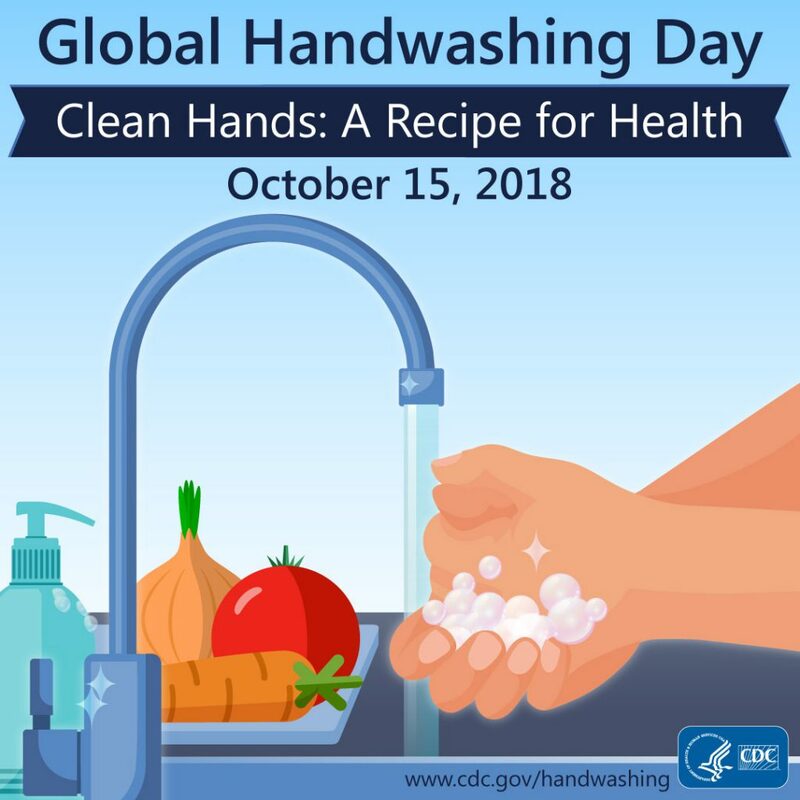 2) Tune in to CDC’s Facebook Live – CDC will host a Facebook Live presentation on Global Handwashing Day at 11 a.m. EDT. During this presentation, a CDC expert will talk about the importance of handwashing and give a live handwashing demonstration on how to properly wash hands with soap and water. 3) Order free posters – Remind school children to fight off germs by washing their hands. Display the posters in highly visible public areas, such as schools bathrooms, work areas, and restrooms. 4) Promote on social media – Visit the social media library to share some of our sample social media messages and use the #GlobalHandwashingDay hashtag to help promote the observance day. You can also create your own messages. 5) Use web content syndication – Add the latest content from CDC’s Handwashing website to your organization’s website. The content is automatically updated when CDC updates it, so your content will always be current and accurate. Visit CDC’s webpage on Global Handwashing Day more information. Thanks for your support in helping to raise awareness of the importance of handwashing!